Our dessert for Easter was this divinely low-fat lemon curd and ricotta cake. I have to confess, it's not entirely homemade, the cake mix is a doctored box mix, and I consulted my reliable Deceptively Delicious cookbook for inspiration. Anyone who knows me well, or has read enough of my blogs can probably figure out, that while I love to cook and eat, I'm not a practiced baker. I have a few baked good items that I make well and can improvise. I am an awesome pie maker perhaps because I take such care to have a light touch when it comes to preparing pie dough. Normally when desserts or cakes are made, it's Liz who bakes. She got the afternoon off for Easter, since it was a long weekend for her work wise, and she already put in a full morning with church services. The baking was left to me. There was a moment of tension when I said I wanted to bake a lighter version of lemon coconut cake. I'm sure Liz was thinking there weren't too many ways I could lighten the recipe or that I could even bake a cake without calling upon her services. Luckily I had a few ideas and recipes to help with the baking. Technically, this cake is a three part recipe. White box cake mix; low-fat lemon curd filling; non-fat ricotta and non-fat cream cheese mixed with powdered sugar and lemon curd for the frosting or glaze. It's not hard to make, but you just have to take your time, have your ingredients together, preheat the oven and cool the cooked and baked items. Herewith is a condensed version of the recipes. My thanks to Susan Hill, who shared the lemon curd recipe. And of course, to Mrs. Seinfeld, for her non-stop inspirational cookbook. Can you tell I love love love it?! Use a medium sauce pot, add the lemon zest, sugar and lemon juice and stir to combine. In a small measuring cup, make a slurry with the cornstarch and water, then add the slurry to the sugar and lemon mixture. Place the sauce pot over medium-high heat and whisk the mixture until the sugar is dissolved. Bring the mixture to a boil; reduce to a simmer and cook for 1 minute. Don't let the mixture come to a rolling boil - it should only bubble slightly. Temple the eggs by ladling in 1/3 of the lemon sugar mixture to the eggs, a bit a at a time so the eggs don't cook or curdle. Whisk the eggs as you add in the hot liquid. Once the eggs are tempered, pour the egg mixture into the hot lemon sugar mixture and put the pot back onto the heat. Stir the mixture constantly until it is thickened - it should coat the back of a spoon. Remove from the heat and pour the mixture into a bowl; cover and chill. Mixture will hold for up to 1 week in a tightly covered container. In a stand mixer or if using a hand mixer and mixing bowl, beat the cake mix and the yogurt on medium speed for 1 minute. Add in them lemon zest and beat on medium for 2 minutes more. In a separate and immaculately clean bowl, beat the three egg whites until they hold soft peaks. Work quickly and fold in the egg whites to the cake mix, 1/3 of the egg whites at at time. Pour the cake batter into the prepared pans and place the pans in the center of the rack positioned in the center of the oven. Bake for 15 minutes. Rotate pans and bake an additional 10 minutes, or until the top of the cakes has risen and springs back when lightly touched. Cakes are done when a skewer inserted into the center comes out clean. Cool the cake in the pan(s) for 10 minutes. Then turn the cake out and cool on a cake rack until completely cooled. Use a stand mixer or a medium mixing bowl and hand mixer. Add in the ricotta and cream cheese and beat on high speed for 1 minute to incorporate. Turn the mixer off and add in the lemon curd and powdered sugar. Turn the mixer on low and gradually increase the speed; beat for 2-3 minutes or until the mixture is smooth and thoroughly combined. The glaze will be thick and pourable. Refrigerate until ready to pour over the cake. Assembling the Cake - I made this cake using two 9 inch rounds. Cut each cake round in half using a serrated knife. Spoon a thin layer of the cooled lemon curd over one layer of the cut rounds, letting the lemon curd soak into the cake. 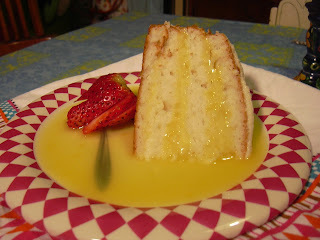 Once the lemon curd has soaked into the cake, spoon some of the ricotta glaze over the cake layer. Top the cake with its cut round. Spoon a layer of ricotta glaze over the first cake round top - this will be the glue that keeps the two cake layers together. Continue with the next cake round - cutting it in half; spooning a layer of lemon curd over the cut round; a layer of ricotta glaze; put the cake layers together. Place the second layer over the first layer. Pour the remaining ricotta glaze over the whole cake. Use an off-set spatula to smooth out the top and glaze the sides of the cake. Refrigerate for 20 minutes to let the glaze set. Refrigerate any left-over cake. Cake will hold, covered and refrigerated for up to 5 days. Once the flavors meld together, it will taste moister and better the next day.